Rotator cuff injuries are one of the more common injuries in the orthopedic setting. Because many people have trouble managing symptoms on their own, physical therapists frequently see patients that need direction on this issue. While a few people stumble through successful management, most do not. Those that take a passive approach by avoiding use of a painful shoulder typically end up with a weaker, stiffer shoulder than when they started. Those who work through pain typically cause more pain and inflammation. To manage a rotator cuff injury well, one needs to know how the rotator cuff functions and ways to keep it healthy. What is a Rotator Cuff Anyway? The rotator cuff is actually a group of four muscles that connect the top of the arm bone to the shoulder blade and control positioning of the shoulder when a person moves the arm. Tendons connect these muscles to the arm bone and produce arm movement when the muscles contract. Although rotator cuff muscles themselves can become painful, injuries typically occur in the tendons. When people speak of a rotator cuff injury, they are typically referring to an injury in the tendon. These injuries typically occur as a result of an isolated incident, but they can develop over time as well. Repeated stress or irritation of the rotator cuff tendon initially causes inflammation, but prolonged exposure to this stress can cause degeneration of tendon tissue as well. Rotator cuff injuries are most prevalent among people who perform repetitive overhead or throwing motions, but such injuries present in any shoulder that has poor mechanics due to weakness, stiffness, or excessive use. Symptoms of a rotator cuff injury typically present as an inability to raise the arm overhead or behind the back, but difficulty with reaching across the body or sleeping on the involved shoulder can occur as well. Pain in the upper arm typically accompanies these movement limitations, but not always. In more severe cases, significant arm weakness can be seen. MRI . . . Help or Hurt? Practitioners diagnose rotator cuff injuries by considering a person’s history and performing physical tests with an injured shoulder before ordering an MRI. Mild to moderate injuries don’t require an MRI because they typically respond well to conservative management with anti-inflammatory medication and physical therapy. In more severe cases, however, an MRI is utilized to rule out structural problems. While images can provide useful insight into shoulder pathology, MRI findings can be misleading. They can trick a person into thinking that shoulder pain is directly linked to a structural defect on an MRI. 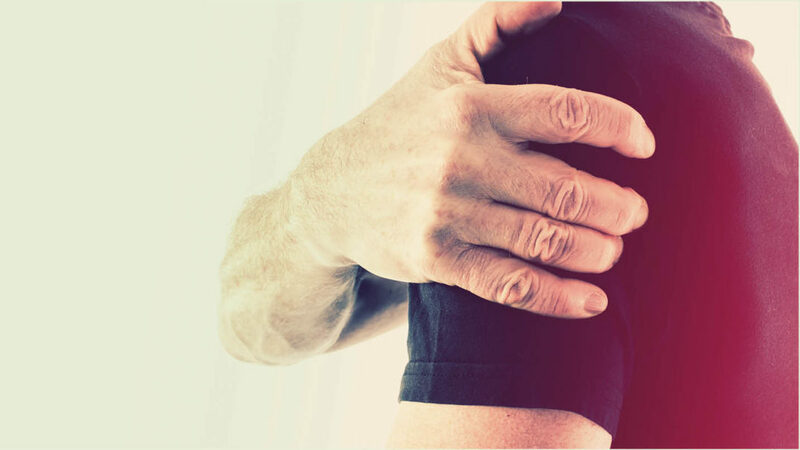 Recent studies show that one-third of people over age 30 and two-thirds of people over age 70 have some degree of abnormal rotator cuff findings with a shoulder MRI despite the fact that they have good use of their shoulder and no complaints of pain. Moreover, 90 percent of “successful” rotator cuff surgeries will still show some abnormal findings on an MRI. These studies tell us that rotator cuff “wear and tear” is a normal part of aging, and more importantly, that structural problems found with an MRI do not necessarily have to correlate with the amount of pain a person experiences. This is great news for those who want to conservatively manage a rotator cuff injury because evidence shows that a person can achieve a pain-free, well-functioning shoulder even though rotator cuff pathology is present. This evidence also indicates that one does not always have to undergo surgery to achieve a successful rehabilitation of a painful shoulder, even when an MRI reveals abnormal findings. While people can’t control some factors like age or genetics that predispose them to rotator cuff injuries, they can control factors such as shoulder strength, flexibility, and the use of their arm with sport or work. Regardless of the factors present, the key to conservatively managing a painful shoulder or rotator cuff injury is to balance activity. 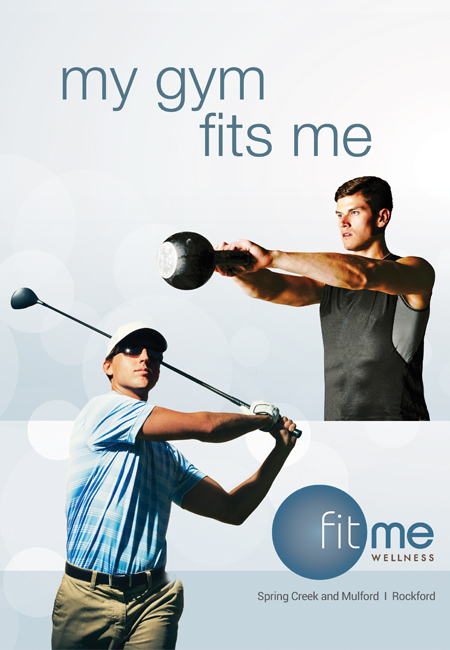 Too much activity will increase inflammation and symptoms; too little activity leads to a stiff, weak shoulder. Just “staying active” does not get the job done either. If a person with a rotator cuff injury wants to take a page out of the physical therapist playbook to manage a rotator cuff injury, strengthening and stretching exercise would be the place to start. As shoulders improve with strength and flexibility, improvements with pain, mobility, and overall function typically follow. Identifying painful movements during work or sport and modifying faulty technique can help put a shoulder on the path to recovery as well. One needs to remember that the role of the rotator cuff is to be precise, not powerful. Its job is to position the shoulder while larger, more powerful muscles move the arm. If the rotator cuff does its job, a shoulder is much less likely to experience pain with overhead movement or heavy lifting. A healthy rotator cuff also protects itself by maintaining good shoulder mechanics with movement. 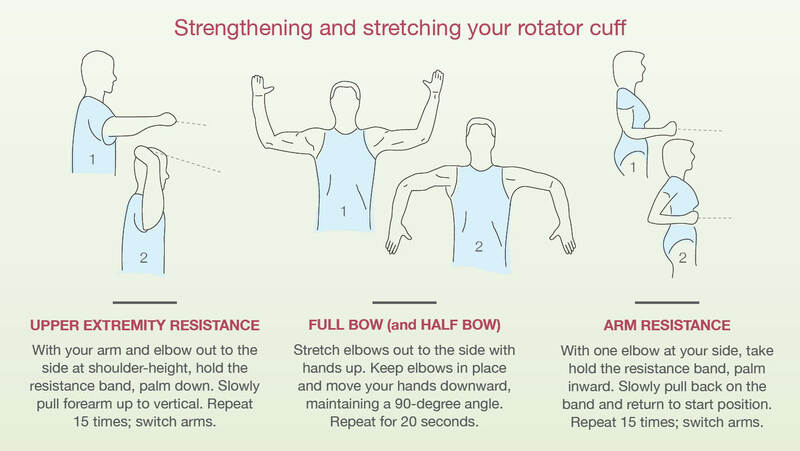 Incorporating a regular amount of shoulder exercise ensures that the rotator cuff continues to perform these functions. While this exercise may seem obvious, most people shy away from exercising a painful shoulder or are unaware that rotator cuff muscles can be specifically targeted. A strong rotator cuff actually helps protect itself from injury, and those who start with the basics will be able to build a good foundation. Balance front and back muscles. People with shoulder pain or rotator cuff injuries typically have an imbalance of muscle strength. Front muscles (chest) are typically strong while muscles in the back (upper back and shoulder blade) are typically weak. Those who spend as much time performing “pulling” exercises as “pushing” exercises create a better balance and optimize shoulder function. Keep helper muscles strong too. The biceps, triceps, and shoulder blade muscles help the rotator cuff do its job as well. While specific rotator cuff muscle strength is essential to keep a shoulder healthy, strong helper muscle strength hastens a shoulder recovery and makes the shoulder more resilient to physical stress down the road. Tightness in muscles that surround the shoulder can make it difficult to reach overhead, out to the side, or behind the back. Tightness also alters shoulder mechanics and puts extra pressure on the rotator cuff with exercise and everyday movement. Gentle stretching to regain lost shoulder motion is beneficial to restore normal shoulder mobility and restore good mechanics with movement. A slouched posture puts a shoulder in a position to cause irritation of the rotator cuff. Maintaining an upright posture during exercise ensures optimal shoulder mechanics when exercising, stretching, or performing repetitive activity at home or work. Josh Meyers, PT, DPT, OCS is the Director of Operations for the Orthopedic and Sports Therapy Institute (OSTI) and practices at Edgebrook Physical Therapy in Rockford.